Antoine Griezmann Spotted Rocking the PUMA Future | RESPECT. Antoine Griezmann was recently spotted wearing the limited edition PUMA Future boot while on Wednesday, September 12th. The PUMA Future boot is from the limited edition PUMA City Pack Los Angeles in partnership with Niky’s Sports. 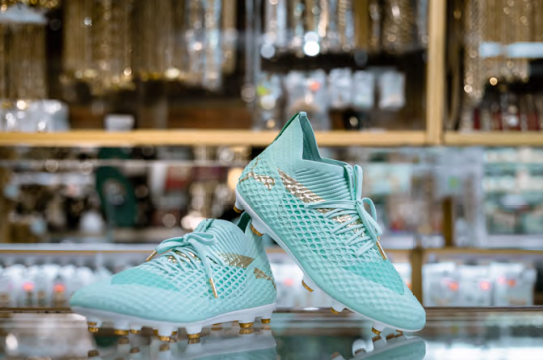 The Future Boot design includes the knitted Netfit upper and bold look on pitch, it perfectly embodies the spirit of the Jewelry District. Known for its radiant history with beautiful art-deco architecture the jewelry district in Los Angeles is the largest in the United States. This silhouette was inspired by cash, gold and precious gems the for its design. With a full muted green upper that gives way for influences of gold to pop throughout. The PUMA Future boot retails for $250 and is available at Niky’s Sports on September 14th.